I read the Spurgeon reading last Friday. It was one of my favourites in Be Still, My Soul. I found it greatly encouraging but could see that there was the potential to feel smug - to allow pride to creep in when faith is "tried and proved." The next morning I was reading Luke 10 (does it sound like all I do is read??) and there I found a corrective against potential pride. It's not quite the same situation but I think the principle applies. No matter what our circumstances are, whether things are good or bad, the one thing that is our source of joy is that we have our names written in the Book of Life. There is an invaluable blessing which is gained by the trial of our faith. The blessing gained is this, that our faith is tried and proved. The way of trying whether you are a good soldier is to go down to the battle. The way to try whether a ship is well built is, not merely to order the surveyor to examine her, but to send her to sea: a storm will be the best test of her staunchness. Sanctified tribulations work the proof of our faith, and this is more precious than that of gold which perisheth, though it be tried by fire. Now when we are able to bear it without starting aside, the trial proves our sincerity. Coming out of a trouble the Christian says to himself, "Yes, I held fast mine integrity, and did not let it go. Blessed be God, I was not afraid of threatening; I was not crushed by losses; I was kept true to God under pressure. Now, I am sure that my religion is not a mere profession, but a real consecration to God. It has endured the fire, being kept by the power of God." Which is not to say that we sail through trials serenely and without flinching. We respond to them in human ways - grief, fear, flight, worry, concern, compassion, confusion... We respond in ways that portray (or betray) our personality and our heart. We respond in ways unknown to us because our normal selves have been taken over by adrenalin. But at the core we hope to find that our abiding trust lies in God who is sovereign over all things. That at the core our hope, confidence and security is found in Jesus Christ and nothing else. And if that is what we find then we are deeply blessed, no matter what. First it was Marilynne Robinson. And now for another excellent trio of books. Nancy Guthrie has edited three excellent anthologies, each for a different season. The first is Come, Thou Long Expected Jesus: Experiencing the Peace and Promise of Christmas, the collection of Christmas readings reviewed here. I loved, loved, LOVED reading this wonderful little book during Advent. The readings were short, which is always helpful during December! Every aspect of the Christmas story was covered, each reading prefaced by its relevant Scripture. What a joy to learn about Christmas in such interesting detail and marvel at Immanuel on a daily basis during this busiest of months. It certainly helped to keep my head and heart in the Right place - more effectively than any other year I can remember - in what is the hurly-burly of December. 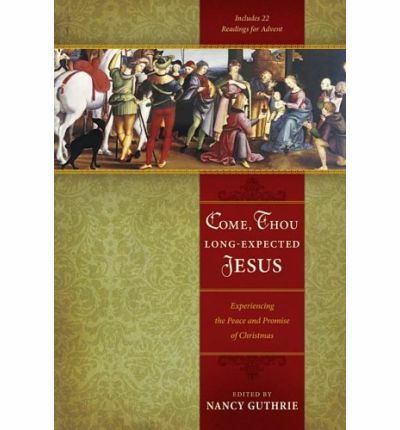 This book would be useful for ministers, Sunday School and Scripture teachers...anyone who gets to teach through the Christmas story each year as it provides plenty of fresh angles to take. And it is useful for anyone who wants to be reminded all through Advent why we stop and wonder at God's goodness on 25th December each year. 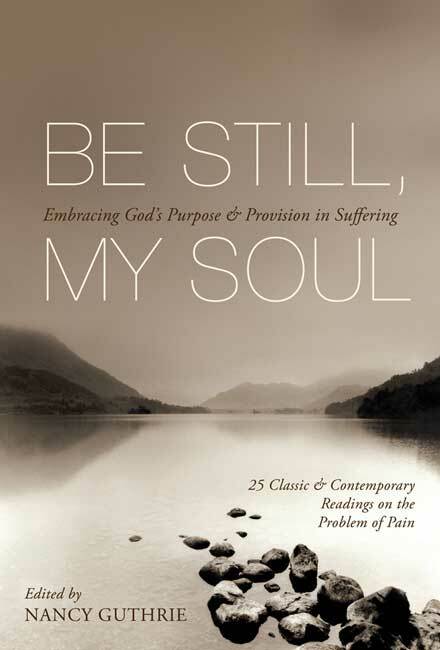 The second collection I read is called Be Still, My Soul: Embracing God's Purpose and Provision in Suffering. As the title suggests, this is an anthology of 25 classic and contemporary readings for the season of suffering. The book is divided into three sections - God's perspective on suffering, God's purpose in suffering and God's provision in suffering. It works on the premise that suffering will happen - to us personally and generally in our midst. We ought not to be shocked by this. And that great comfort and blessings are to be found in suffering when in our weakness we become strong in Him, as we learn to lean on and trust in and depend upon God in our times of trials and as our faith is tested during these times. Nancy Guthrie is no stranger to loss and suffering, having lost two infant children to a rare genetic disorder. She can deliver this anthology with integrity. I have to say that I feel perfectly positioned to review this particular book. (Now there's a bold statement!) It's the sort of book that is excellent to read during the good times in order to instruct and prepare heart, mind, body and soul for a godly response to suffering when it comes. And I started reading it at the very best of times - just towards the end of the long summer holidays, feeling refreshed and relaxed and at my most hopeful and optimistic for the year...you know, life before the committees and commitments start up again and you think you will be conquering dragons this year given all this energy and spare time you seem to have. I found myself well taught as I started making my way through this book and wondered how well it would translate into a book that actually provides comfort and perspective during a time of suffering. As it happened, halfway through the book my circumstances changed and I found myself at least on the edges of a situation of substantial suffering. I kept reading. It was a great comfort. It worked, not unlike the Advent book, keeping my head and heart in the Right place during a difficult time. This book is a profoundly useful resource. 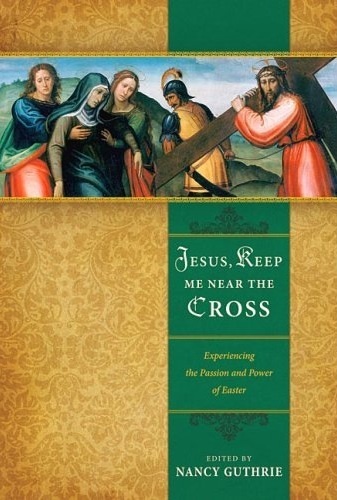 The third member of this trio is Jesus, Keep Me Near the Cross: Experiencing the Passion and Power of Easter. Now I haven't actually read this book. I am saving it for the four to six weeks leading up to Easter this year. But here is my second bold statement for this post...I warmly commend this book to you even though I haven't read it. Go and get yourself a copy - and get one for a friend as well. At one level I wonder whether it will have quite the same impact on me as the Advent book did. The lead up to Easter is much less busy and Easter naturally invites quiet reflection. But the line up of contributors is as good as ever so there is no reason to expect anything but good to come of diving into this collection as Easter approaches. In thinking about all three anthologies it is worth noting that some readings will resonate more than others because of style of language, points of emphasis, personal experience and understanding - but they are truly worthwhile volumes. The other benefit is that they provide a snapshot of a wide range of great writers, theologians and preachers, which may prompt further reading if you find someone new to you who sparks some interest. I have been twice bold in this post and as it turns out, once misleading. In clicking on Nancy Guthrie's website I have discovered that this trio is about to become a quartet. Oh Love That Will Not Let Me Go: Facing Death with Courageous Confidence in God is set to be released later this month. But that is a BIG topic for another day. Here is a great little biscuit recipe from the great The $120 Food Challenge. 1. Preheat oven to 170°C and line a baking tray with baking paper. 2. Cream sugar and butter in a large bowl with electric beaters until creamy and fluffy. 3. Add condensed milk and flour and mix in thoroughly. 4. Add your flavourings as required. 5. Roll teaspoonfuls of dough between damp hands into a ball and place on baking tray. Press down slightly with a fork. 6. Bake for about 10 – 15 minutes or until golden brown. The biscuits will harden once they cool. This recipe will yield about 120 biscuits OR...and here is the really wonderful thing...you can divide the mixture into three equal amounts, cook with one portion and wrap the other two parts with gladwrap and freeze for use at a later stage. Forty lovely biscuits ready for lunchboxes, morning teas and suppers this week. And the potential to make eighty more when these run out. I am thinking coconut and lemon, fruit and nut, plain with a glace cherry on top... They would work well stuck together with marshmallows - this biscuit mix isn't nearly as sweet as the Marshmallow Kiss recipe - or with nutella, as suggested at the $120 Food Challenge site. ACTS is another and very well known prayer schema. It's a really helpful way to organise one's prayer life, praying one's way through that list, and it ensures that prayer doesn't degenerate into a whiny, needy shopping list. I have used it often, although not slavishly or exclusively. But as I listened to Tim Keller's sermon on prayer at the pool I was delighted to learn of a new way to use this schema. He described using ACTS as a means of meditating on Scripture. He suggests taking a short passage of Scripture and then, having read through it a handful of times, pray through it using ACTS. And I decided to have a go. Adoration - what a GREAT God we have, that He is worthy to be loved with all our heart, soul and mind, and that he gives us people (neighbours) to love. And what a great God that He gave us Jesus. Confession - DO I love Him with all my heart, soul and mind? And do I love my neighbour (and I started with my own family) as I love myself? There was plenty to confess there - we were well into the long school holidays by then! This section probably took me the longest. Thanksgiving - for a God who forgives, for a God who invites us to be in relationship with Him and to love Him with all our heart, soul and strength, for a vast array of neighbours to love, that those I love also have big hearts to forgive me when I don't love them as well or as fully as I should. Supplication - for a bigger heart, capacity and desire to love God with all my heart, soul and mind and to love my neighbour as myself, and for new and creative ways in which to do this. I have had some good times of "meditating on Scripture" in the past but generally I either don't do it or when I do try, find myself floundering or distracted pretty quickly. I found this use of ACTS profoundly helpful - I think it will be a very useful tool as I learn how to pray in God's will without distraction and am looking forward to applying it to many other passages from the Bible.